As of June 2018, Instagram has over 1 billion users and 500 million daily active users. It’s a behemoth of a social media channel which continues to grow at an unprecedented rate. But what does that have to do with you? Well, if you’ve ever wanted to monetize Instagram, then now’s the time for you to do so. Given the sheer size of the global audience, it’s fair to assume there’s a niche market out there for you. Regardless of the kind of content you create, there’s an audience for you. One that, in all likelihood, you can leverage to earn a fortune. Although it is a platform designed to share photos and videos on, with the right approach, you can monetize Instagram. But before we talk about the different ways you can monetize Instagram, let’s look at what you’ll need to achieve that. This is never going to a simple task. 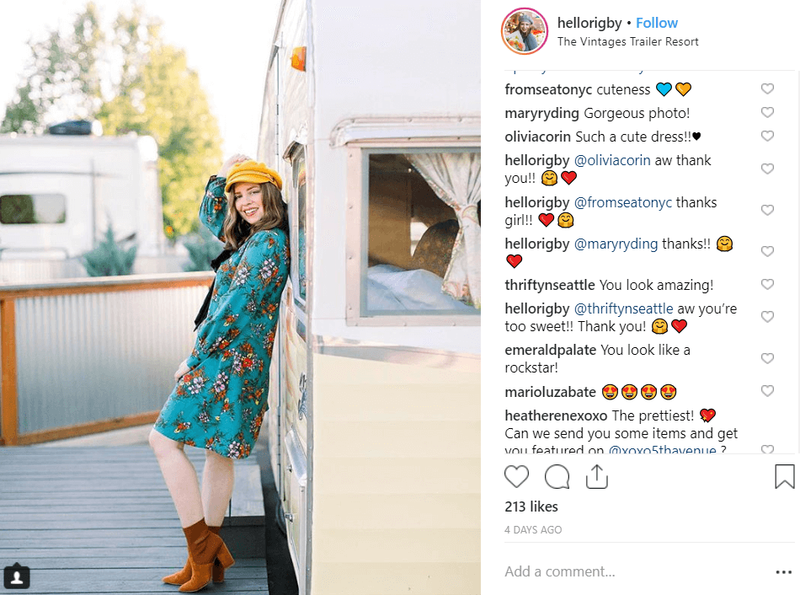 It takes more than just a catchy Instagram name, quirky description, and posting photos to make money using the platform. It might work well to impress your personal circle, but it takes a lot of hard work and patience to monetize your Instagram account. The question you need to ask yourself is why would businesses be willing to pay an Instagram user, like you, money? They would do so to gain exposure and access to your audience, in the hopes of selling their products to them. Starting out, your audience size is low and unlikely to be able to drive sales for your own or a brand’s products. You need to grow your reach, organically, to at least a few thousand to be able to have an impact. But reach, alone, isn’t enough. To generate sales, you need to be able to create and share compelling content. Your followers have to take actions based on your product recommendations. Thus, having a reach and an influence over the purchasing power of your fanbase is critical. 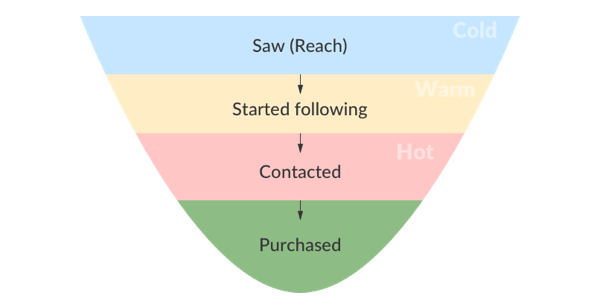 Here’s what an Instagram sales funnel looks like. Having a sizeable fanbase does, mathematically, increase your chances of appearing in the feeds of more users. But what’s the point of that if people don’t engage with you or your content? The trick to increasing engagement is to create content that solves certain content needs for your audience. And how can you measure that? Not by the number of followers you have, but the number of people liking, commenting on, and sharing your posts. If you have an “engaged” community, brands will be more willing to invest in you to drive their profits. Just take a look at Jenna Farmer. She has a relatively small audience of around 4,900 followers. 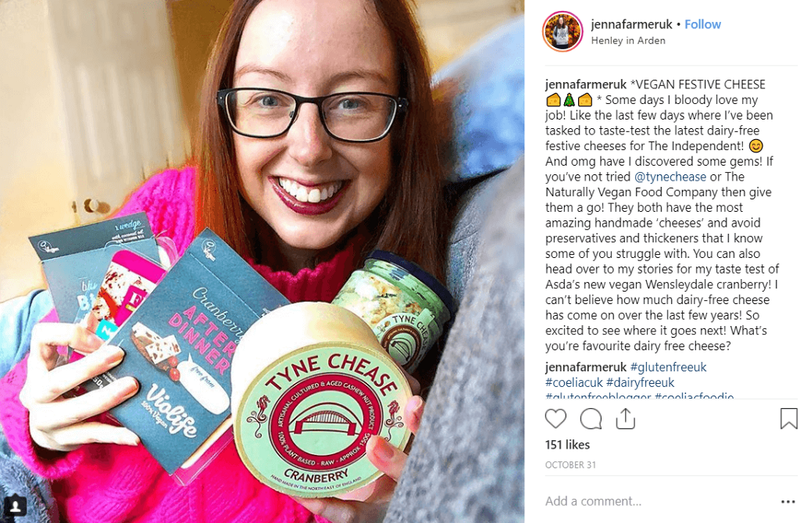 Yet, she still managed to garner 151 likes and 15 comments on this post promoting Tyne Cheese. That’s a very respectable engagement rate of 4.2% (approx). Now, we’ve covered the most basic requirements that you’ll need to meet to monetize Instagram. But what can you do to actually achieve that social reach, earn that influence, and attain high engagement? Regardless of whether you’re a business or individual trying to monetize Instagram, you need to post wisely. Your profile bio is valuable real estate you can leverage to pitch to first-time visitors. I’d advise that you have a simple, crisp, and perhaps quirky, bio. Showcase your creativity and what value you might add to them. Let’s take a look at Luvvie for inspiration. Her bio is catchy, visually appealing, and establishes her brand’s credibility. To nurture any relationship, you need to interact with each other on a regular basis. The same principle extends to your presence on Instagram. You need to post content and engage your followers on a regular basis. It helps to set up a fixed posting schedule. One that aligns with the times your audience is most likely to be on the tool. According to Tailwind, there is a positive correlation between the frequency of posting and engagements rates. Not only that, the more you post on Instagram, the faster your audience will also grow. Take this to a whole new level by regularly interacting with your followers in the comment section of each post. This will go a long way to show your followers that you genuinely care and appreciate them. Jenn, here, is a great example of that. Hashtags are a great way to improve the discoverability and reach of your content. While Instagram allows you to use a maximum of 30 hashtags, I personally recommend a decent 10–15 for the maximum effect. Remember, though, you shouldn’t be using any random hashtags. Try using ones that are relevant to your posts and will help you reach out to bigger audiences. Feel free to get creative and witty with your hashtags, as well. The Brothers Buoy sure know how to do this right. One of the most important things you need to do to monetize Instagram is to improve your content quality. There are plenty of content creators out there vying for the attention of your target audience. Standing out in this sea, then, is more than a task. Always use high-quality images and never repeat your product pitches. Base your captions on your actual experiences with brand products to come off as genuine and more engaging. Additionally, you should strongly consider leveraging video content in the form of Stories or even on IGTV to stand out. 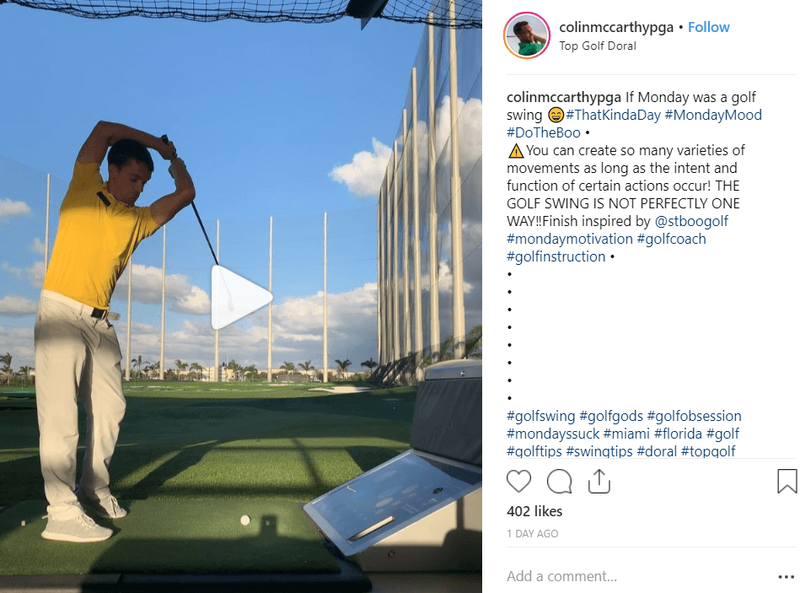 Take a page out of Colin McCarthy’s playbook and rake in those engagements by leveraging video content. As a user who’s only starting to monetize Instagram, quality content and compelling captions will only get you so far. An important element of growing your reach and influence is cultivating relationships with other content creators from your niche. You could always get in touch with them and ask them for a shoutout on one of their posts. Or you can actively engage with them and their followers on their posts. Better yet, you can collaborate with them to create content together. 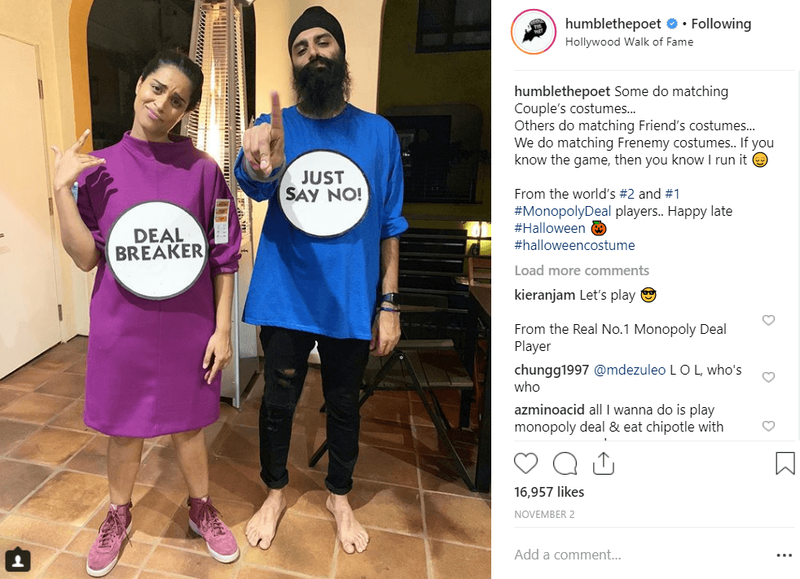 Humble The Poet and Lilly Singh (@iisuperwomanii) are known for their collaborative content. We’ve covered what you need and some pro-tips that will help you monetize your Instagram account. Finally, let’s talk about some of the different methods you can use to achieve this. Once you achieve “influencer” status, be it as a micro or macro influencer, you could leverage your influence to promote brands. Once you have established your thought-leadership in your niche, you can monetize Instagram for a profit. 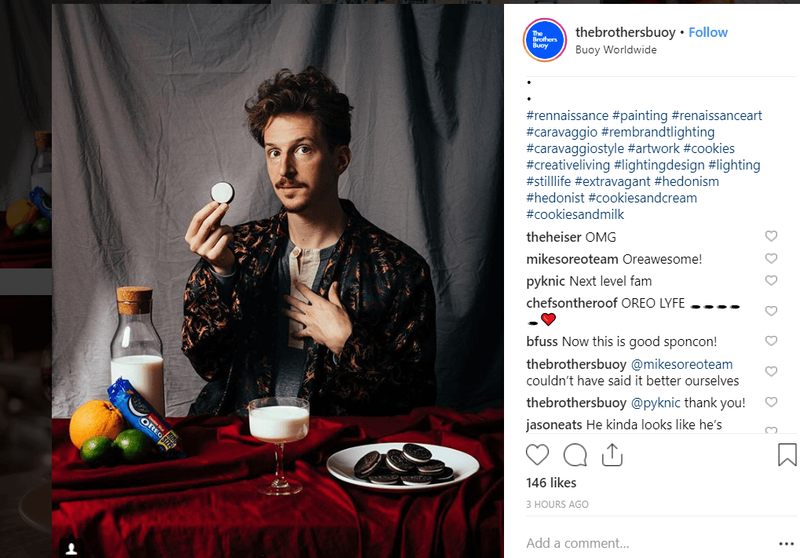 Oftentimes, brands partner with influencers for sponsored posts that help spread the word about their offerings. Typically, such posts revolve around the product itself, with a small review from yourself. It’s important that such sponsored posts should blend in with your other content so as to not seem overly promotional. 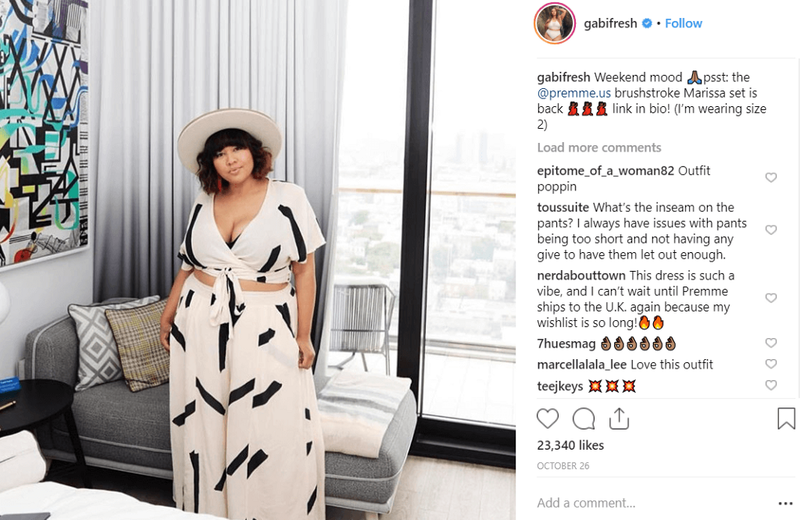 For instance, if you’re a plus-sized apparel influencer, then you want to be working with brands that promote body positivity. That’s why Gabi, here, often partners with brands like Premme because they align with her personal values. One of the easiest ways to monetize Instagram is by becoming an affiliate marketer on the platform. Essentially, you work as a brand ambassador for certain products that you use and believe in. Your audience may find it helpful if you share a link or discount code, with them, for the products you’re promoting on your page. Whenever someone buys a product using your custom link, you get a certain percentage of the revenue generated. Affiliate marketing is a good starting point, primarily because there aren’t any barriers to entry. Moreover, most products have some sort of a self-enrollment program. All you need to do is sign up and they’ll provide you with a custom link for you to share with your Instagram posts. The trick is to use a compelling copy along with an attractive photo that gives users a reason to consider the product you’re marketing. Here’s a good example of what that looks like. Cassie Andew pairs a high-quality image with a compelling copy. Note how she’s incentivizing people to buy using a special discount code. Building on the above premise, you can always do for yourself what you would otherwise do for brands. Confused? 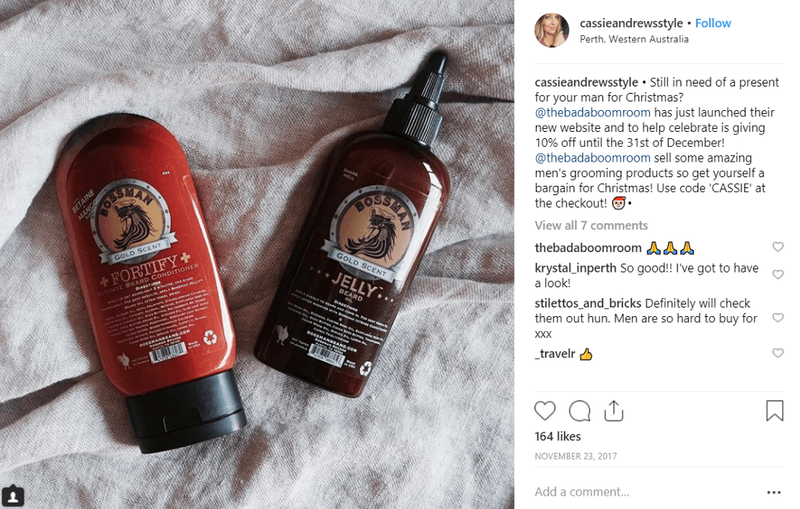 If you have a strong personal brand and aren’t too keen on promoting other companies on your page, you could always market your own products. So long as you have an ardent fan-following, you can easily monetize Instagram this way. Design and sell your own products like clothing, books, merchandise, cosmetics, etc. So long as the items relate to your niche and resonate with your audience, you can use Instagram to sell them. 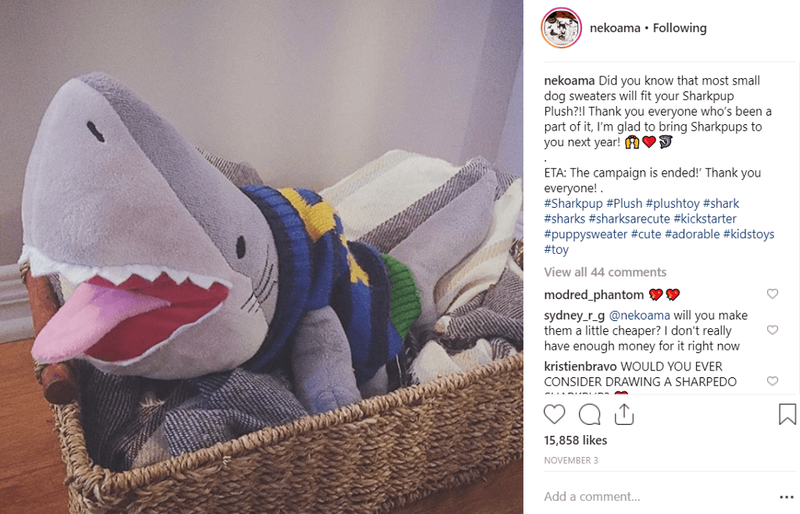 Cartoonist, Nekoma, has done well for herself by starting her own store and then leveraging Instagram to promote it. She promotes her art, comics, and plushies by sharing related content on the platform. People follow you on Instagram for a reason. They love your content and are looking to learn from you. So, why not teach them how to be like you? There’s a huge pay-off in creating information products to market on Instagram. 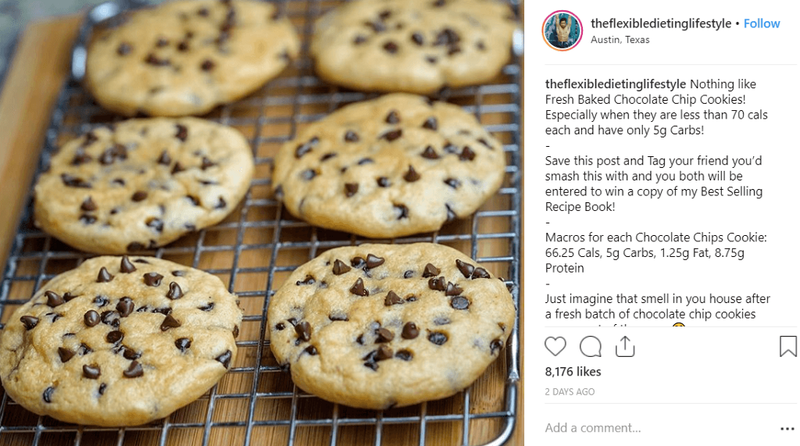 Zach Rocheleau, for one, uses the platform to teach his followers how to make a healthier version of their favorite junk food. Alternatively, you can become an Instagram marketing guru and help budding content creators or brands improve their capabilities. After all, if you’re good at something, you should never do it for free. Take your knowledge and become a social media marketing consultant, write and sell ebooks on the same to monetize Instagrams. Product placements have been around since the dawn of video advertisements. And there’s no reason why you can’t do the same to monetize Instagram. Basically, you create a video that features you using a product and then earn some money for advertising it. Explainer videos, DIYs, testimonials, or even quirky shorts are a good way to go about producing such videos. Now, you could either do this using normal videos or Instagram Stories, but if you want to stand out, I’d recommend giving IGTV a shot. A lot of brands are looking to partner with content creators on IGTV, and you should make the most of this opportunity. If you’re a budding content creator and are looking to earn a fortune, Instagram is definitely the platform to be on. Not only is it easy to monetize Instagram, but it presents you with ample opportunities to do the same. What are your thoughts on the subject? We’d love to hear from you in the comment section. Shane Barker is the Founder and CEO of Content Solutions and Gifographics. You can connect with him on Twitter, Facebook, LinkedIn, and Instagram. Join our Facebook Group. Contact us for a sponsored post. Write for us. Find your next marketing job on GrowthJob.com. 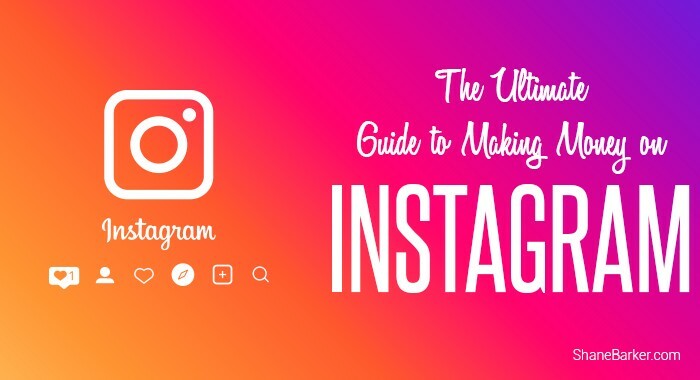 The Ultimate Guide to Making Money on Instagram was originally published in Marketing And Growth Hacking on Medium, where people are continuing the conversation by highlighting and responding to this story.